OnePlus 5T Star Wars Limited Edition smartphone has been launched in India at an event in Mumbai on Thursday. Launched just ahead of the release of Star Wars: The Last Jedi movie in India, the limited edition smartphone features a white back panel with a Star Wars logo on it, a red Alert slider, apart from 10 preloaded wallpapers, and other software customisations. 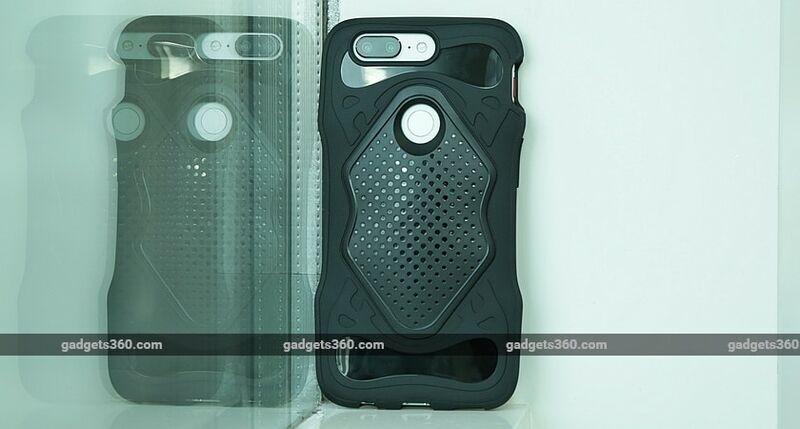 The company has also bundled a rugged case with the OnePlus 5T Star Wars Limited Edition, one that is modelled on Kylo Ren's helmet from the movie. Getting really geeky, OnePlus explains the Sandstone White back panel of OnePlus 5T Star Wars Limited Edition smartphone is inspired by the white-coloured salt plains of the mineral planet Crait, featured in the movie. The red of the Alert slider is based on the red-coloured mineral mined on the planet. The box - which also features Star Wars branding - also contains Star Wars stickers, apart from the standard OnePlus ones. Finally, there is a customised theme with red accent, black and white colours. The Star Wars partnership for the OnePlus 5T Limited Edition is only in India and a few Nordic regions, OnePlus said, such as Denmark, Finland, and Sweden. The OnePlus 5T Star Wars Limited Edition price in India has been set at Rs. 38,999. The smartphone will only be available in an 8GB RAM and 128GB inbuilt storage variant, with OnePlus choosing to forego the 6GB RAM and 64GB inbuilt storage variant. This makes it Rs. 1,000 more expensive than its regular edition counterpart. As for availability, the OnePlus 5T Star Wars Limited Edition will go on sale from midnight (12am IST) of Friday, December 15 - the same day that Star Wars: The Last Jedi releases in the country - via Amazon India and OnePlusStore.in. It will also go on sale via OnePlus Experience stores in Bengaluru and Noida, while stocks last. OnePlus also said it will hold pop-up events in 9 cities across India. Users will be able to experience and purchase the OnePlus 5T Star Wars Limited Edition at the pop-up stores across 6 cities in India on December 16 and 17 - Bengaluru, Chennai, Delhi, Kochi, Mumbai, and Pune. Hyderabad and Kolkata will also have their own pop-up stores. Venues will be detailed on the company site. As for launch offers, and as a part of the company's anniversary celebration in India, all OnePlus buyers will be eligible for zero cost EMI, Rs. 2,000 extra off on the exchange of any OnePlus device and Rs. 1,000 extra off on the exchange of any other device. Additionally, Axis Bank debit and credit cards users are eligible for a Rs. 1,500 instant discount on purchase of any OnePlus device including the OnePlus 5T Star Wars limited edition. OnePlus users will also be eligible for a complimentary 12-month Accidental Damage Insurance by Servify on downloading the Kotak 811 savings account and activating it with an initial deposit of Rs 1,000 in the introductory period. OnePlus 5T Star Wars Limited Edition customers will get up to 1TB of additional data from Idea. Customers are also eligible for 1 year of free membership of Zomato Gold — the newly launched premium subscription offering from Zomato. All the above mentioned anniversary offers are available till December 19, 2017. The OnePlus 5T Star Wars Limited Edition comes with 128GB of inbuilt storage. Connectivity options include 4G VoLTE, dual-band (2.4GHz, 5GHz) Wi-Fi 802.11ac with MIMO 2x2, Bluetooth v5.0 with aptX and aptX HD, NFC, GPS/ A-GPS, 3.5mm audio jack, and a USB Type-C (v2.0) port. Sensors on board the OnePlus 5T include an accelerometer, ambient light sensor, digital compass, gyroscope, proximity sensor, and an RGB sensor. It also bears a fingerprint sensor on the rear panel. It is powered by a 3300mAh non-removable battery, weighs 162 grams, and measures 156.1x75x7.3mm.